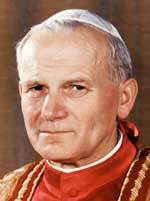 Blessed John Paul II, whose feast day now is Oct. 22. 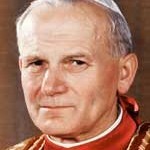 Blessed John Paul II will be included in liturgies as an optional memorial in the proper calendar of the dioceses of the United States, the U.S. Conference of Catholic Bishops announced Oct. 19. The U.S. bishops last November voted overwhelmingly to request the addition of the popular pope, who reigned for 27 years, into the U.S. liturgical calendar, and the Vatican Congregation for Divine Worship has approved the insertion. It also has provided the proper liturgical texts for observance of the memorial in the Mass and Divine Office, or Liturgy of the Hours. Liturgical prayers and readings for the feast can be found here. The Office of Readings includes an excerpt from Pope John Paul’s homily at his inauguration as pope in 1978, when he stressed, “Do not be afraid! Open, I say open wide the doors for Christ.” The message became one of the signature statements of his papacy. According to a USCCB statement, the biographical piece in the Divine Office highlights the pope’s pastoral visits around the world, his participation in the Second Vatican Council and his zeal for families, young people and the sick. The text also notes his promotion of the Catechism of the Catholic Church and the new Code of Canon Law.